I was having a discussion with a friend after one too many Gin and Tonics about UK drugs policy. I recently read "Drugs - Without the Hot Air: Minimising the Harms of Legal and Illegal Drugs" by Professor David Nutt, who was famously sacked by the UK government after claiming that horse riding is more dangerous than taking ecstasy. Me: "UK drugs policy is not evidence based and according to the evidence we should do X rather than Y." Me: "The evidence about the harms of drugs." Him: "Yes what evidence is that?" Me: "Well, I don't know the original papers and haven't read them but the guy who wrote the book knows the evidence and these are his recommendations." His final response was, "Well then", implying that because I didn't know the original research literature my argument was invalid. What logical fallacy has he committed here? I understand I am almost committing the appeal to authority fallacy but at some point a scientific consensus builds based on the available evidence and those of us who are non-experts need to trust someone to synthesise and present that evidence accurately, which is what I've done. I've taken a look at the following image and similar sites but nothing seems to fit the bill. One thing about being careful about in informal logic is knowing that there are exceptions to every fallacy. Rather than thinking "appealing to authority is a fallacy", think that there are valid and invalid ways of appealing to authority. 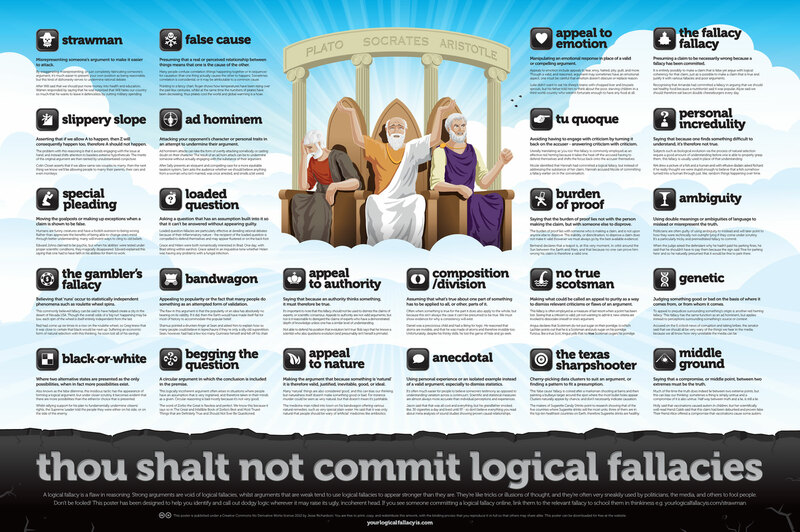 In fact, this is one view of what fallacies are. Fallacies are tricky because they resemble valid forms of reasoning. In your case, you're assuming that he is committing a fallacy by asking for the original research about the harmful effects of drugs. I'm not really sure I could defend your argument, as is. Then again, you just had a casual discussion mixed with alcohol, not exactly the hall of reason. Think of logical arguments as the sort of thing you would prepare yourself with thoroughly if you were about to make your case to a rational judge. You should ask yourself if the rational judge would want to see the original research. Exception: Appealing to authority is valid when the authority is actually a legitimate (debatable) authority on the facts of the argument. So the argument could be debated, not necessarily on the original research as if you were both experts on the matter, but on the credibility of authorities that you are citing. In your case, you would both need to know something about the author of the book you read, and whether he should be considered a reliable source. Are there other experts who disagree with him? Not the answer you're looking for? Browse other questions tagged logic philosophy-of-science fallacies or ask your own question. What is, and isn't the appeal to emotion logical fallacy?